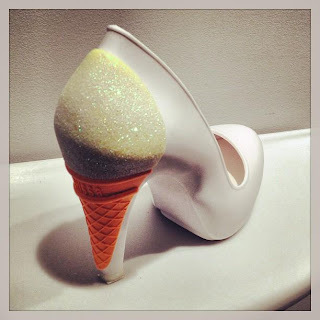 Domestic Sluttery: Sluttery Fantasy: Karl Lagerfeld Ice Cream Shoes! Ok, confession time. I can't stand those Vivienne Westwood Melissa shoes that a lot of my chums coo over. The jellied hearts don't do it for me. But one shoe in Melissa's new collaboration with Karl Lagerfeld has been SCREAMING at me all week, and given the godawful weather today, it should cheer us all up. TADA! See, if it weren't unutterably horrible outside and the world didn't look like it had been painted in the most boring shades of a Farrow and Ball paint chart, I could get even more excited about these ridiculous shoes than I am. I hear terrible rumours that the ice cream on each pair of shoes is scented, putting me in mind of the time I had a Perfume Puff Pony called Lavender Lace, circa 1989. Oh Karl! Now, obviously there are other shoes in the range, but they're all a bit beige compared to the ice cream shoe, which is just amazingly bonkers. They're going for $199.99 in Brazil at the moment, but recently launched in New York and should be headed over here soon - there's no price or stockist as yet. Fingers crossed eh - I've come over all My Little Pony! If that's set your craving for a fantastic heel, have a look at Irregular Choice, or fork out for Kobi Levi's incredible range. SHUT UP. I love them. I could never ever walk in them, but never mind. I would just look at them on my shelf and occasionally cautiously lick them. And that's how the last 15 minutes have been spent. Exactly. I think Facebook is going to explode in a cloud of "THEY'RE GODAWFUL!" "SHUT UP THEY'RE WONDERFUL!" It'll be fine, no one has yet set upon a campaign to 'raise ice cream awareness'. ICE CREAM GIVES YOU A HAIRY TONGUE. Yes, I think that's why I don't like them as much as I want to. It's a little bit 'let's stick an ice cream cone here!' rather than really going with the idea. Kobi Levi would have rocked these.